Sign up for Dura-GRIT's Newsletter to Receive Exclusive Deals! Long Lasting, High Performance for up to 35,000 rpm drills! Last Hundreds of Times Longer than Sandpaper! 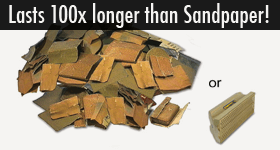 Sand Thousands of Linear Feet of Wood with One Disc! Great for 1/4'' chucks and Industrial Hydraulic Drills. Speeds up to 20,000 RPM! Versatile, long life carbide tool sets! Watch Demo Videos of DuraGRIT Carbide Tools in Action!